Wendy Magdalena Braca lived in a Victorian mansion under three moons in Jupiter City. But her privileged upbringing falters when after the death of her father and the murder of her mother, she is shipped away to Greenleaf Asylum for Troubled Girls and lived there for years until she is “rescued” by a strange guild that shows Wendy their world; the world of Guild Assassins made up of the Cæcus (normal humans), the Validus (magic-users), and Half-Breeds (demi-gods). In this world, Wendy discovers she is the most special and powerful Validus known to exist, the Curse Breaker. 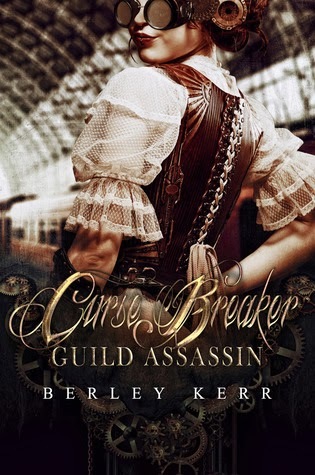 I was supposed to feature GUILD ASSASSIN, the first book in Berley Kerr's Curse Breaker series yesterday for my weekly Steampunk feature but despite it seemingly steampunk cover and teasing blurb, GUILD ASSASSIN is more of a sci-fi fantasy than a Victorian throwback. I'm usually disappointed when this happens because I don't like feeling duped, fortunately I found the story enjoyable and I look forward to more. GUILD ASSASSIN in relation to the series is a book introduction from the world and it's many realms, how magic is woven with science, who Wendy Magdalena Braca is, the different Guilds and it's assassins. I am not the biggest sci-fi fan regardless if it has paranormal elements and scorching romance. How the Universe works and the many ways man can manipulate its rules makes my eyes glaze. My former physics teacher will second this. Giving credit to Mr. Kerr, GUILD ASSASSIN is written for sci-fi idiots like me. He wrote the history about the Realms and its stargate portals the way you'd explain Star Wars and the concept of light years to a 7yo child. So even if the world of Curse Breakers takes place in the near/distant future, as Wendy and the rest of her Guild are jumping from one Realm to the next, it has that throwback feel to it as what the girl's costume in the cover suggests. The world building and how BKerr wove it with certain historical events and tied the concept of Validus (or Mage) and their magic to gods, pantheons, etc. was wonderful. I loved his vivid imagination, the way it feels past, present and future at the same time, and the extent of the world he created especially the simplistic way he wrote it. GUILD ASSASSIN as I've mentioned is a book of introduction centered on Wendy Braca, the current Curse Breaker. Wendy was framed for the murder of her mother 9 years ago and was sent to a mental asylum. Robert and Rosalia, who worked with her while her case was being tried, broke her out of the institution, faked her death, and started training her to be an assassin. Her motivation being finding out who really killed her mother and why. Now my critique here pertains to the characters and how they need more fleshing out. On paper, each character starting from Wendy, have interesting roles and characteristics. In action they all start blending together. Wendy in particular needs more contrast, she felt like she was just floating around and following her herd. We met her when she was 12 and have significantly grown since then but said growth wasn't highlighted well. I didn't quite feel her conflict, her desire for revenge and justice, and when she accidentally killed two innocents, even then I didn't feel her grief and contrition from that mistake. But like with most first books in a series, I'm thinking that GUILD ASSASSIN's purpose was to focus more on the mythology and world building with the character development taking a backseat. I HOPE that the next book will give us a better picture of Wendy and her crew because the novel is very character driven which makes the gray characters all the more stark against the colorful backdrop. Overall I really enjoyed GUILD ASSASSIN, BKerr is a "friendly" writer for sci-fi dummies like myself and I look forward to reading more of his Curse Breaker tales. Glad you were able to enjoy this despite it not being the genre you thought it was. Yeah that's rare. I hate "false marketing" in books. I know you dabble in this genre, I hope you check it out. Even with the characters needed to be more fleshed out, I'm glad he took the time to explain the world in detail. The heavy SciFi scares me away, but I am thrilled you found such a good story. Great review, Braine! I am mot a fan of it either. Good thing I was Ianthe mood when I picked this up otherwise on to the DNF pile it goes! Despite this not being a true steampunk, which seems to happen too frequently, I like the sound of this. The cover totally rocks as well. I will have to keep it in mind. You crack me up. I love sci-fi, but I do fall in the sci-dumb category. Sounds like some unique stuff going on with this one. hehe, sci-fi idiots..oh lord your review is funny. I like the cover, and this does sound good. OH yes I would be with you on that. Usually I don't like it when the cover puts off one thing and the book is totally different. Yay for it working this time though! I DNFd a lot of books over false marketing. Gotta give it to Kerr for managing to keep me glued. It's fun that it's for sci-fi idiots lol because I'm totally like that. It sounds nice, I didn't know about this one but in the end I don't really know because you know it's a mix I'm anxious about. Haha! Love the review! So glad that someone writes a book for dummies like us, filling us in on the sci-fi details. This really sounds like a good read.